The impression this sight made on the artist spurred him to depict it shortly afterwards in three paintings. The first of them, Boats with Sand, features two moored boats viewed from a very oblique, high perspective, as if captured from a very tall quay from which some men unload sand, not coal, in full daylight. Later, perhaps at the end of August, he painted two similar pictures, this time showing the sunset: Coal Barges and the Museo Thyssen-Bornemisza Stevedores in Arles. The high viewpoint of the first painting is replaced by a composition closer to the ground and its forced perspective by a more frontal view. This new focus enables him to depict a broad, orange-tinged atmosphere in which the dark foreground boats and buildings on the other side of the river stand out against the light. The likening of the darkness of night to the blackness of the coal unloaded from the vessels was no coincidence. 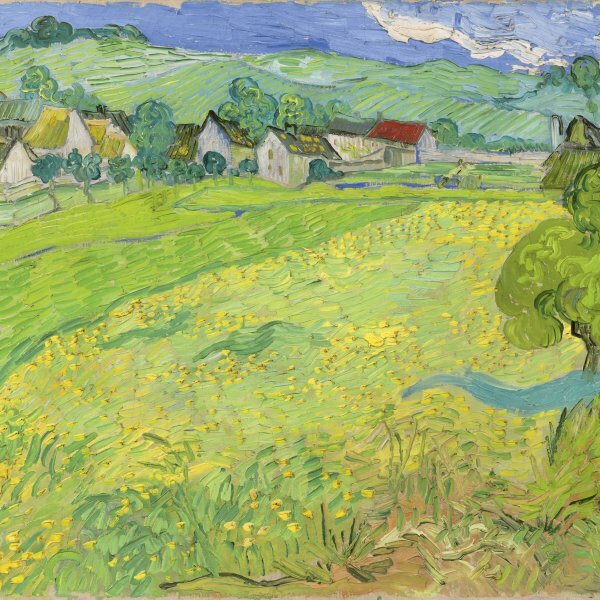 Van Gogh did not settle merely for appearances but strove to seek meanings and used colour to express certain feelings. In his comparative study of the painting in the Thyssen-Bornemisza collection and that belonging to the private collection, Ronald Pickvance states that although both were painted from memory in his studio in the place Lamartine using the same rapid, confident brushstrokes, there are substantial differences not only in their size but also in the handling of the composition. Furthermore, as in other works painted in Arles, the work in the Museo Thyssen-Bornemisza displays the lengthwise marks caused by the manner in which the canvas was rolled up to be moved at some point. 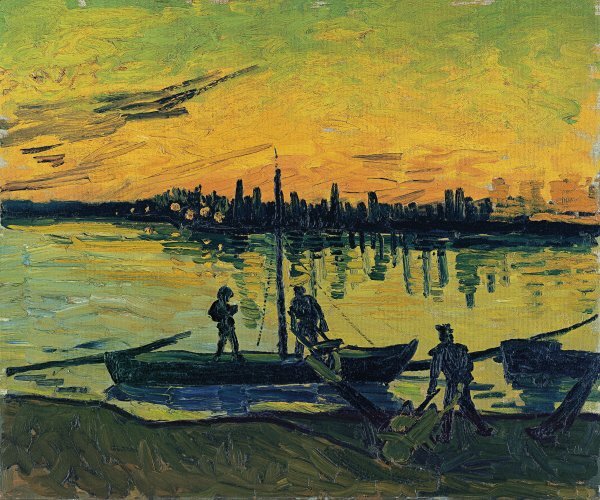 The Stevedores was exhibited in summer 1905 with the title Zonsondergang in the Van Gogh retrospective at the Stedelijk Museum in Amsterdam, in which his sister-in-law Johanna van Gogh-Bonger brought to light most of the artist’s Estate. Later, from 1910 onwards, it was included in several exhibitions organised by Paul Cassirer in Germany.